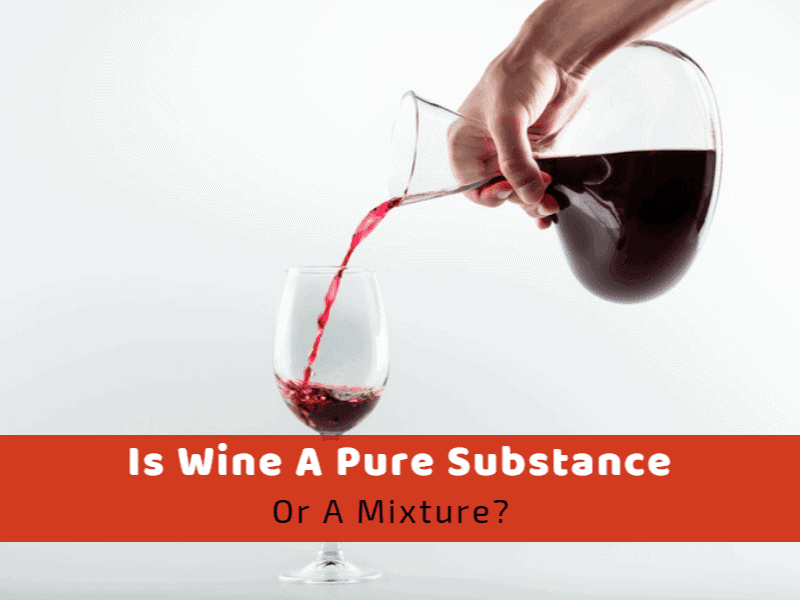 Is Wine A Pure Substance Or A Mixture? >> Is Wine A Pure Substance Or A Mixture? A lot of people often wonder if the wine is a pure substance or a mixture, and a lot of the confusion comes down to some misunderstands about wine and how it’s made. In order to fully answer the question, we first need to look at how wine is actually made, as well as if there’s anything mixed into it, which would answer our question. We should also define what exactly a pure substance is, as we’d need to be clear on that in order to define whether or not the wine is a pure substance or a mixture. Once we’ve got both definitions done, it should become pretty clear as to whether or not wine fits into the definition of a pure substance. A pure substance, in non-chemistry jargon, is essentially a substance with both definite and constant composition with distinct chemical properties. To avoid confusion, in chemistry a pure substance is often referred to as a chemical substance. Through that definition, we could infer that a mixture is anything that’s opposite to this, i.e., a substance which changes composition over time. To make it even simpler, a pure substance is anything composed of a single type of material. In other words, it is free of contaminants. So, in addition to elements, compounds, and alloys, a pure substance might include honey, even though it consists of many types of molecules. Where one might think that wine is a pure substance lies in the fact that ethanol can also be considered a pure substance. As this is the active ingredient in alcohol, it might be the reason why so many people think that wine is also a pure substance. However, as we demonstrate further below, this might not actually be the case, or at least, it isn’t with wine. Wine goes through what’s called a fermentation process. Fermentation is when sugar from fruit, in this case, a grape, starts to join with yeast and bacteria in order to produce alcohol. In most cases, the fruit needs to be crushed and then have these two added; however, with grapes, it’s slightly more complicated than that. You see, grape juice and sugar are located on the inside of the grape, whereas yeast is abundant in the skin of the grape. This is the same no matter what type of wine it is; simply put, the three major types of wine are only different mainly due to what types of grapes are used; colorless ones for white wine, stained ones for rosé and dark-skinned ones for red wine. The grapes naturally start to ferment as soon as they’re crushed, as the yeast and bacteria in the grape skins mix with the sugar in the insides of the grape. Once the grapes are allowed to ferment, the sugar will start to blend with the yeast and bacteria in order to start creating alcohol. As the fermentation process proceeds, the sugar content will gradually reduce to around the 2% range, while the alcohol content will gradually increase to between 9% and 12%, depending on how long you let it ferment for. All of that may lead someone to believe that wine is a pure substance. However, what they’re forgetting is that the end product of the fermentation, i.e., the wine, is a mixture of what began at the first stages of the entire process, namely the yeast, bacteria, and sugar that were kept separate in the grape in the beginning. As we defined a pure substance in the beginning as something that doesn’t change its chemical makeup, then we can rule wine out as a pure substance due to the fact that it changes its chemical composition several times throughout the entire fermentation process. Thus, it could be argued that wine is a mixture and not a pure substance. However, it’s easy to see why people think that it might be; as we’ve already mentioned, ethanol is another word for pure alcohol, which is present in wine. This is probably the simplest and most plausible reason why a lot of people may have been confused on the matter.